(Beyond Pestimcides, December 14, 2016) Preliminary research presented this week at the British Ecological Society’s annual meeting identifies yet another troublesome connection between the use of neonicotinoid pesticides and the health of bees, a critical pollinator species. The research links neonicotinoid use with an impaired ability of bees to learn to vibrate flowers and shake out the pollen, which is necessary for fertilization in crops like tomatoes and potatoes. This research is consistent with other studies that link neonicotinoid use to reduced learning in bees, as well as other impacts such as those on their colony size and reproduction, as well as contributions to overall declines. :which include imidacloprid, thiamethoxam and clothianidin, have been found by a growing body of scientific literature to be linked to Colony Collapse Disorder, a phenomenon where bees experience rapid declines from hive abandonment and bee die-off, and pollinator decline in general. Neonics are associated with decreased foraging and navigational ability, as well as increased vulnerability to pathogens and parasites as a result of suppressed bee immune systems. In addition to toxicity to bees, pesticides like neonicotinoids have been shown to also adversely affect birds, aquatic organisms and contaminate soil and waterways, and overall biodiversity. For this study, researchers used two separate bumblebee colonies and split each colony into three different groups. 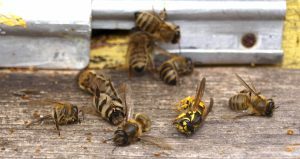 Two of the groups were then exposed to the neonicotinoid thiamethoxam by being fed a solution, while the third group of each colony served as the control and was not exposed to the pesticide. The solution contained thiamethoxam at a rate of two parts per billion, or 10ppb of the pesticide, a concentration the researchers say mimics the exposure bees would find in crop fields. According to the report, “After each visit to the buffalo-bur flowers used in the experiment, the bees in the control group learned how to buzz more pollen out of the anthers. But those in the 10ppb group did not improve at all.” This is significant because while all flowers do not require shaking by bees to release their pollen, other flowers require work on the part of bees to ensure pollen is transferred. Penelope Whitehorn of the University of Stirling in Scotland, who led the study, explained the process in this way: “Bees produce a vibration — or buzz — to shake pollen out of these anthers like a pepper pot. The bee lands on a flower, curls her body around the anther and grips the base with her mandibles. She then rapidly contracts the flight muscles to produce the vibration, without beating her wings.” She called the findings “striking,” going on to say that “[t]he implication is the bees take less pollen back to the colonies and the colonies will be less successful, meaning there may be fewer pollinators overall,” making it the latest devastating effect of neonicotinoids on bees. The study will be submitted to a scientific journal next year. In response to the findings, a spokesman for the agrochemical company Syngenta, which manufactures thiamethoxam, argued that exposure to thiamethoxam in the field is usually closer to 3ppb instead of 10ppb, but he made no further comments to discredit the connection between the chemical and the ability of bees to learn how to shake off pollen. This is not surprising, as neonics have long been identified as a major culprit in bee decline by independent scientists and beekeepers, yet chemical manufacturers like Bayer and Syngenta have focused on other issues, such as the varroa mite. In light of the shortcomings of federal action to protect these beneficial organisms, it is left up to advocates and consumers to ensure that we provide safe havens for pollinators by creating pesticide-free habitat and educating others to do the same. Take action by calling on EPA to suspend neonicotinoids now. You can also declare your garden, yard, park or other space as pesticide-free and pollinator friendly. It does not matter how large or small your pledge is, as long as you contribute to the creation of safe pollinator habitat. Sign the pledge today! Need ideas on creating the perfect pollinator habitat? The Bee Protective Habitat Guide can tell you which native plants are right for your region. For more information on what you can do, visit our BEE Protective page. This entry was posted on Wednesday, December 14th, 2016 at 12:00 am	and is filed under Agriculture, Alternatives/Organics, Chemicals, Corporations, Environmental Protection Agency (EPA), Increased Vulnerability to Diseases from Chemical Exposure, neonicotinoids, Pesticide Drift, Pesticide Residues, Pollinators, Wildlife/Endangered Sp.. You can follow any responses to this entry through the RSS 2.0 feed. You can skip to the end and leave a response. Pinging is currently not allowed.